Add a little more water, squish it around, and enjoy the lathery goodness! Do I need to wash the Lux Puff? Yes indeed. Like anything, soap scum, products, etc. can build up on the surface of the material creating a barrier that will will effect the bacteria blocking properties of the silver salt. 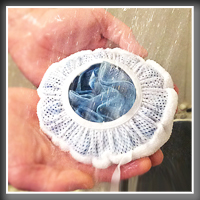 Thoroughly rinsing all product after each use and hanging The Lux Puff to dry will ensure many months of performance. Is it washer / dryer safe? Absolutely! If you want to wash it (ie. 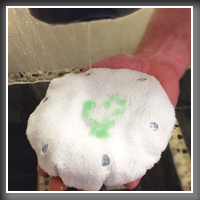 to remove makeup, stains, soap residue or product buildup ) simply toss it in the washer (cool or warm water only) then tumble dry air or cool dry. Please avoid any heat settings. Also be aware that commercial dryers “low” setting may still use heat. If the machine does not specify cool or air dry then please avoid using commercial units. I don't like chemicals!! - Is Polygiene Safe? Great question – we don’t either! We understand new things can be scary but rest assured, we put a lot of research into how we wanted to deter bacteria in the Lux Puff. Polygiene is NOT a chemical and is completely safe; not only for you and your skin, but also for our environment. You can read more about Polygiene here and see which other companies have made the move to natural silver salt for it’s bacteria blocking properties. How long will The Lux puff last? 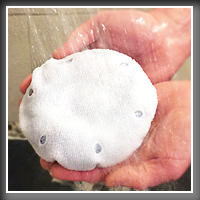 With regular care and use, The Lux Puff will absolutely outlast regular bath poufs many times over and others don’t have the natural anti-bacterial protection that our Lux Puff has to keep them fresh and clean. We have been getting feedback from customers (a few even posted on our Instagram page as well) that received these when we launched six months ago and they are still going strong. For us, we are still using our pre-production Lux Puffs going on 9 months. On the flip side… no pun intended… sort of ? … we have a customer who is a Professional Wrestler that goes through them much faster because (by his own admission) he is a “vigorous scrubber” lol. All this being said – with regular use they are constructed to last a very long time. How long does Polygiene last? Is it okay if my Lux Puff didn't completely dry overnight? We understand your concern about this but rest assured, even if it is not completely dry, it will still block 99.9% of the growth of bacteria. 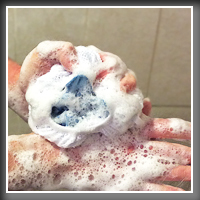 The main thing you need to do, just like any bath product, is to make sure it is thoroughly rinsed of all residual product, soap, etc and wrung out like you would a regular washcloth and hung to dry. 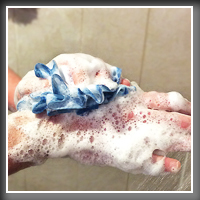 Did you wring it out as you would a regular washcloth? 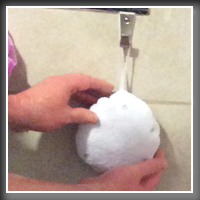 How humid is your bathroom? Is it hung up or left on the edge of the tub? Rest assured, this isn’t your average shower pouf 😉 With proper care, the bacteria blocking properties are hard at work to keep it fresh and clean. Our packaging is classified as a PP #5 plastic. Most all major recycling centers and door to door recycling pickup services accept this. Even Whole Foods has a recycling containers for these. Where can I buy the Lux Puff? They are available directly from our website. If you are an Amazon Prime member, you can order from Amazon as well . We are currently working with several retailers (can’t say who – it’s a secret… shhhh) but will announce this as well. If you live anywhere else outside of North America, send us a message with your location and address so we can determine the best shipping option to your location.